Beaverton officer: 'Most misunderstood topic' in law enforcement is focus of public academy session. The next time they read or hear about how police confront someone who appears in trouble – or is suspected of committing a crime – two Beaverton residents say they will better understand what officers face. 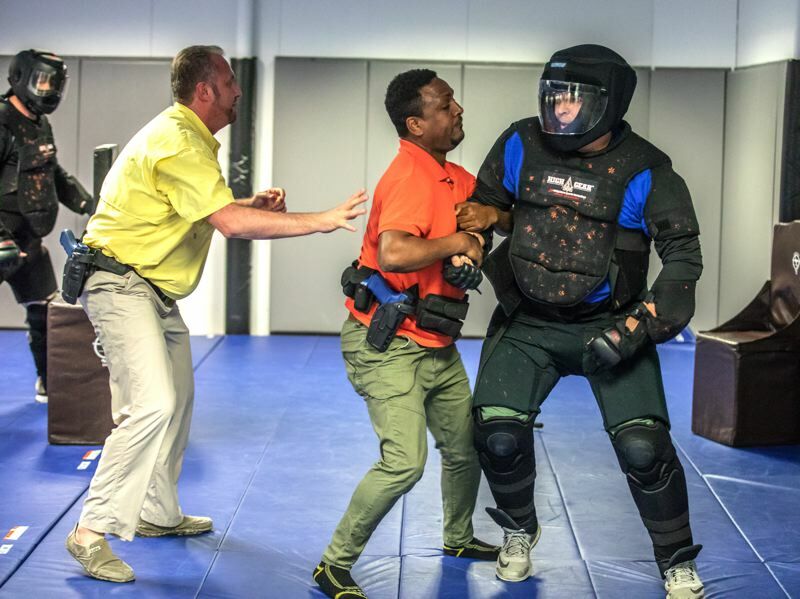 Peter Grill and Mesay Keltu were among the eight volunteer participants as Beaverton police officers laid out four scenarios of when and how they decide to use force. None of the situations involved the use of a gun. 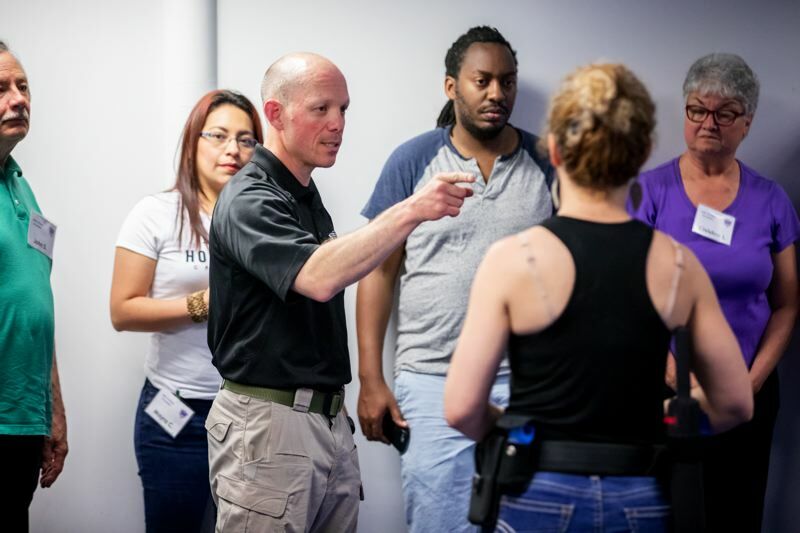 It was up to the participants — and the other two dozen enrollees in the spring Beaverton Citizens Police Academy — to show what they learned from training officers during the previous two hours. "Practical situations are not the same as talking. When you say it, it's easier than when you do it. It's totally different," Keltu said after his stint. "It was scary, even in a phony situation like this. I just froze. Still it's scary when you are putting a hand on somebody else." Grill said he was wary about volunteering. "For me, it's the difficulty of approaching a stranger and not knowing the situation you are walking into. You kind of expect cops to know everything as they go in. But every situation is different," Grill said. "You cannot assess somebody's strength until you are in there with him. It was intimidating, that's for sure." The use-of-force session was part of the 10-week academy, which police conduct in the spring and fall. Participants undergo background checks as they enroll. In addition to the hands-on demonstrations, other optional activities are a ride-along in a patrol car and a tour of the Washington County Jail in Hillsboro. "It is probably one of the most successful programs we have," Police Chief Jim Monger said. "The academies fill up and we are going to continue doing them." Beaverton's academy observes its 25th anniversary this year. Sgt. Tom Crino, one of the officers who conducted the use-of-force session, said police drill a lot more than the three hours the citizen attendees underwent that night. "So when they see things, it's not the first time they see them," Crino said. "There's no way you can feel it until you put yourself in our shoes." James (Jamie) Beane, the other trainer, has been in police work nearly two decades — "it's a dynamic and unpredictable job" — and a full-time trainer since 2010. "My intent is to give you a pause," he said, when people see or hear about police use of force. "This is the most misunderstood topic in law enforcement." Even though police have handcuffs, batons and pepper spray in addition to firearms, Beane said, what counts more often are the words they use — and repeat — to defuse tense situations. • Rousting someone sleeping outside a convenience store. • Dealing with someone who is drinking in public and urinating. The volunteer participants were confronted by an officer playing the role of the offender, who said: "I want to finish this (beer). Do you want me to piss in your face?" • Responding to a domestic-disturbance call from a father seeking to expel his adult son, who had been drinking and then took a swing at his father and police, despite the father's plea to officers, "Don't hurt him." "That was a little more physical than we normally get" during the demonstration, Beane said. • Breaking up a fight between two men at the Beaverton Transit Center. Well-padded officers played the roles of the often-uncooperative people that the volunteer participants had to deal with. Beane has faced a use-of-force situation in one well-publicized case. He was one of two officers involved in the 2014 shooting death of Chelsea Fresh, who came out of her house and pointed a rifle at them. A 2015 investigation by the district attorney concluded that the officers' actions were justified. A few months after they conducted this session, Crino was promoted to lieutenant and Beane to sergeant. Chief Monger swore them in during a ceremony Tuesday night. During a talk preceding the demonstrations, Beane said the goal of police is to use the least amount of force necessary to stop a threat. The "reasonable" use of force stems from a 1989 decision by the U.S. Supreme Court, which laid out objective standards for police to follow to avoid conflicts with the federal constitutional ban on "unreasonable" searches and seizures. Among the standards: The severity of the crime, the threat to police or others, and whether someone was resisting arrest. Also in the mix: the Oregon Constitution, which has a similar ban, and state law; how the courts interpret the law, and agency in-house policies. A 2007 law requires police agencies to adopt policies on the use of deadly force. "I make decisions based on the information at the time," Beane said. Courts use that standard — not based on hindsight — but can consider what police would do given similar experience and training. Grill and Keltu said they understood Beane's point better after taking part in the demonstration. "It's easy to generalize and easy to see what a majority would say being outside, instead of being involved in a practical situation and seeing what happened," Keltu said. Grill: "It definitely illuminates the other side of the story. You learn that cops walk into a lot of situations that we are not aware of. It's easy for us, watching from the outside."